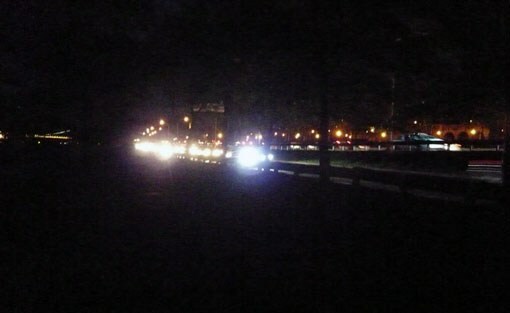 At night, cyclists are blinded by oncoming car traffic on the Henry Hudson Parkway along this notoriously poorly-lit 23-block greenway segment. If you ride the Hudson River Greenway at night, these orange cones are a sight for sore eyes. They are sitting on top of the bases for new lighting fixtures along the 23-block greenway segment known as the Cherry Walk, where cyclists currently have to contend with poor visibility at night. The Cherry Walk spans the area roughly between 102nd Street and 125th Street. Not only is it dark, but in the absence of lighting, oncoming car traffic can blind cyclists, making topography and any obstacles along the path difficult to discern. Streetsblog first wrote about the poor visibility on the Cherry Walk more than a decade ago. Upper West Side resident Ken Coughlin, who co-chairs the Manhattan Community Board 7 parks committee, has been advocating to improve conditions on this segment of the greenway for years, along with co-chair Klari Neuwelt. He sent the above photo of the first visible signs that better lighting is on the way. While the greenway is managed by the Parks Department, the lights are being installed by DOT, says Coughlin. Greenway users flagged this problem years ago, but progress has been slow, in part because this section of the greenway was not initially built with connections to the electrical grid. The cost of adding electrical hook-ups and lighting fixtures will be $1.2 million, DOT told Coughlin. The new fixtures will be “Riverside Park luminaires,” which do not focus light directly at the ground. The installation so far only runs a third of a mile, but Coughlin said he expects the new lights to extend the length of the Cherry Walk. Repaving the rutted asphalt on the Cherry Walk is a separate project and remains unfunded. The Parks Department has pegged the cost at $5 million, said Coughlin. Fantastic news. It’s impossible to see when going northbound at night. Especially since it seems like one out of every ten drivers has forgotten the unwritten rule that you’re not supposed to use your blindingly bright high beams as the default. Either that or headlights have just gotten a lot brighter as time has gone on, with LEDs and whatnot. Awesome! After 10 years, we got a one-mile section of bicycle facility almost up to the very basic standard of a car facility in the city. A car facility with occasional bone-shattering humps and hillocks! The lights have gotten brighter. The road surface is slightly higher than the Greenway for a good portion of that trip, so, while car headlights cut off at a certain height above the road surface, a cyclist is perfectly in that light zone. But drivers use their high beams as well. I’d actually prefer a resurfacing before lighting. My lights light up the path well enough, and with a slight left turn of the head, I can avoid being blinded by oncoming cars. But the insane bumps along that path make it really treacherous. In fairness the highway has that too. That is, the light of course illuminates the ground but it spreads out in other directions as well, which isn’t ideal when competing with the lights of oncoming cars. At tonight’s CB7 Parks & Environment committee meeting, a Riverside Park official said a total of 87 lights will be installed. Re: slight left turn of head- to look directly into the high beam arms raise of oncoming cyclists. I don’t usually go this way after dark — it’s just off what would be my usual commute route. I imagine ambient lighting will help with being dazzled by oncoming headlights, but also imagine this won’t be perfect. Baffles that block or dim oncoming headlights still seem like they’d be ideal.